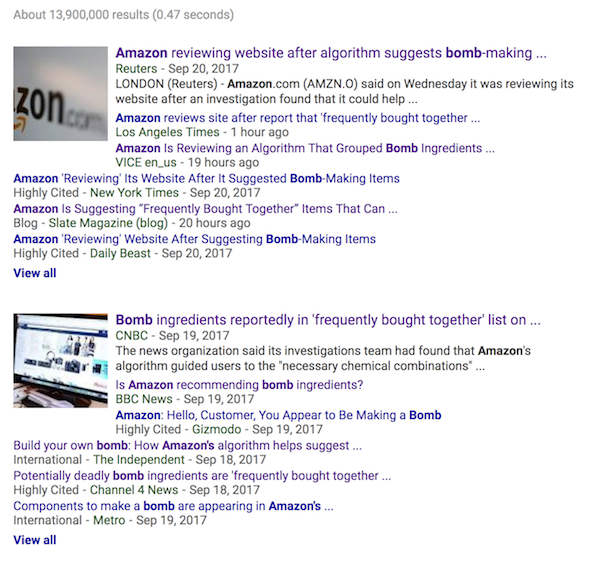 UK public broadcaster Channel 4 sparked a presswide panic with a story: "Potentially deadly bomb ingredients are ‘frequently bought together’ on Amazon." But the ingredients are common black powder ingredients. Black powder is useful for many hobbyist applications ("fireworks, model rockets, antique firearms, or to blow up the occasional stump") but it's not a useful bomb-making compound (that would be TATP, which is also synthesizable from common Amazon ingredients). They were further alarmed by the fact that Amazon also recommended ball-bearings, characterizing these as "shrapnel." These are used in ball-mills, this being the tool you use when you make black powder. Channel 4 also notes that people who buy magnesium ribbon also buy iron oxide and aluminum powder -- these being the ingredients in popular science-classroom demonstrations. As Maciej Cegłowski puts it, "Channel 4 has discovered that fireworks enthusiasts and chemistry teachers shop on Amazon."